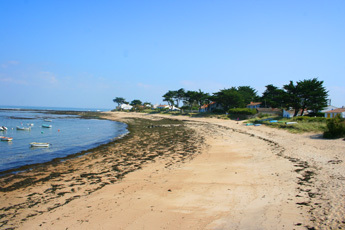 As with most islands, the Ile de Noirmoutier has a varied collection of beaches from the pretty Plage de Dames to the aptly named Plage d'Or. Many are in small picturesque coves with boats moored offshore, others are long stretches of sand backed by dunes. The island is often called a displaced Mediterranean island, this is due to the whitewashed cottages and buildings, the cuisine which is maritime and fresh and a landscape that is vibrant and vivid. 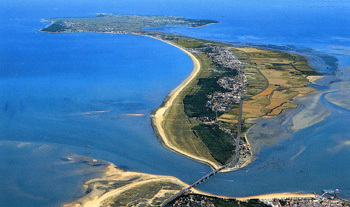 Noirmoutier is a very flat island it is mostly just a few meters above sea level, with the maximum height being 22 metres. The island is in the shape of a figure 8 with the top part having the smaller beaches and coves with rocky outcrops while the western side of the lower part is almost one continuous beach. Plages Les Sableaux. 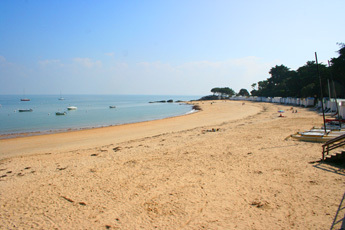 This is the main beach for the town of Noirmoutier en l'ile. 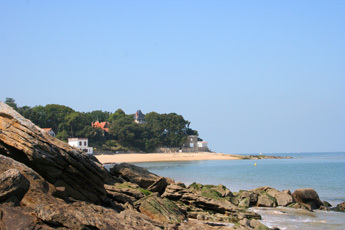 Plage de Souzeaux. This is a pretty cove with a good sandy beach bounded by rocks. It is not the easiest place to find a parking space so you need to be prepared to walk. 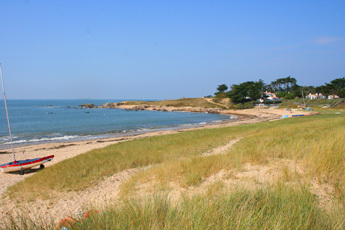 Plages de la Clere. This is a long cove on the north east side of the island, it contains several entrances all of which are given names but the biggest is at Le Grand Vieil, a small village with facilities and a boat ramp. Le Petite Vieil. 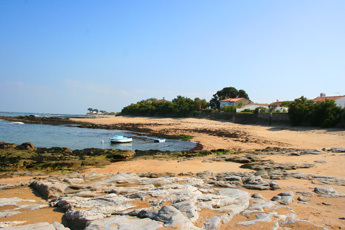 Just around the corner from le grand Vieil this charming cove with cottages and pine trees close to the sands, and small boats moored offshore, is well sheltered from all but northerly winds. La Madeleine This is a small village on the north of the island with its beach running out to the Pointe des Charnier. Les Conches des Normands. 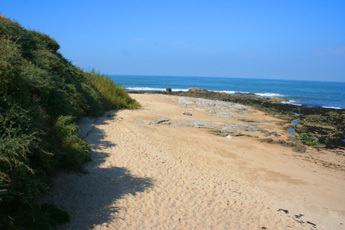 These are the beaches of the town of La Liniere, and here there is a long beach that runs to the east of the harbour. Plages de Lazeronde. These beaches are situated on the North West corner of the island, and there is parking with boat ramps on either end of the beach. The beach is backed by sand dunes and forest to the north and dunes with (the) salt marshes to the south. Although not authorised areas towards the centre of the beach are used by Naturists. Plage de la Bosse. 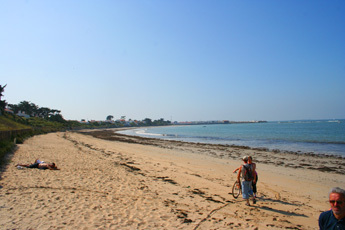 The beach starts at the port de Morin and runs south, it is backed by dunes and pine trees. Plage de Eloux This is a pleasant beach backed by dunes and forest. Pages des Sables d'Or This is the start of the long beach that continues down to the tip of the island, the northern end has access amongst the houses and further south there is a track through the dunes. Plages de Midi. As the name suggests this is the middle section of the long beach which runs south to the tip of the island. 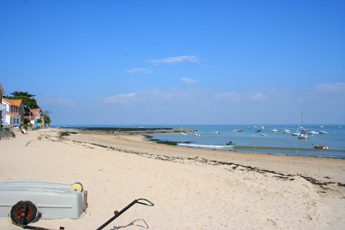 There are several parking areas and boat launching facilities, and the beach serves the commune of Barbatre. La Fosse. This is the final beach before the bridge, and is a favourite for kite surfers.